juslyktht: FIFA World Cup 2010 Started. My Feelings Till Now. FIFA World Cup 2010 Started. My Feelings Till Now. 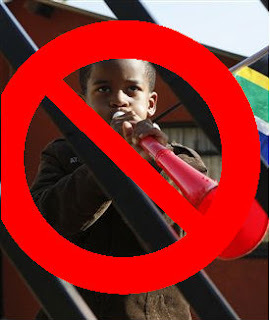 First of all ban the 'Vuvuzela' , is my feeling as well. Watching world cup football with my headphones and music on, is an indication that something is definitely not right about the Vuvuzelas or the 'African Horns'. Apart from being vociferous, they are the symbol of aggression and antagonism as well. World Cup event is a fusion of cultures, with every other culture holding equal right and place. Where African Horns are definitely dominant. Secondly I have not seen any long range "wonderstrikes" till now, and every clash is ending in a very low scoring match. Except for Germany Vs Australia (scores 4-0).